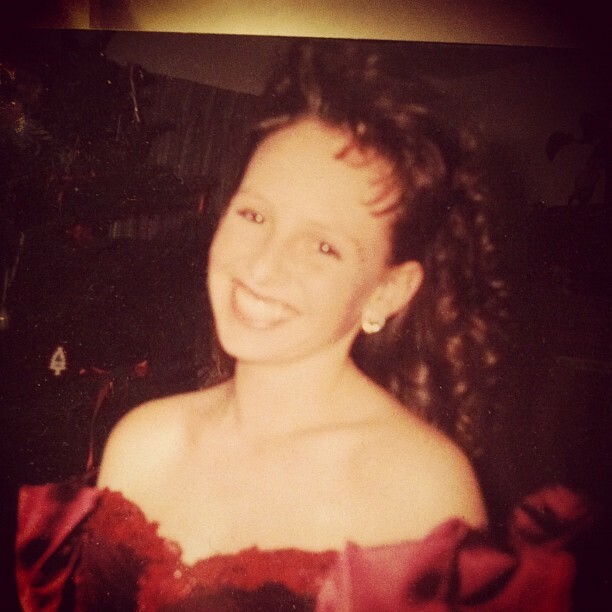 This post brought to you by collar bones, 80’s hair and heart-shaped rhinestone earrings. Oy. I keep this pic and one other tucked into the mirror on my dresser. Sometimes I wish I could take that girl, shake her, and tell her all the things she should or shouldn’t do in the next 15 years! Just so she would have an easier time. Just so she won’t have regrets. Alas, I wouldn’t be who I am today if she hadn’t plunged on, heedless of the consequences, and experienced all that she did. There are more good memories than bad, thankfully. I was actually pretty tame in comparison to a lot of people my age but, like everybody, I have things I would have done differently.